I know if you retire before 63, you get penalized so many percent per year. I was wondering if you could “retire” or stop working say at 60, live off of deferred comp, or another small job. Then start drawing at 63 from NYS to avoid getting penalized. If I work until I’m 60, I’ll have 32 years with the state. Yes, you can leave public employment before age 63 and wait until age 63 to retire and begin collecting your NYSLRS pension in order to avoid a reduction. However, your eligibility for health and death benefits may be affected if you leave public employment before you begin collecting your pension. We recommend that you speak to your health benefits administrator to find out how your health benefits would be affected. We also recommend that you speak to a NYSLRS customer service representative to find out how your death benefits would be affected. To get the account-specific information you need, please email our customer service representatives using our secure email form (http://www.emailNYSLRS.com), and one of our representatives will review your account and respond to your questions. Filling out the secure form allows us to safely contact you about your personal account information. Hello. I started with NYC at 24, have almost 4 years of credited service and am planning on buying back ~2.5 years of time. If I work until 64, I’d have about 40 years of service, which according to my understanding of Tier 6 should be 75% of my FAS. However, some of my coworkers were saying that there is a cap on years of service for the benefit calculation. I cannot find that anywhere in the NYCERS literature or through this website- and I assume that would be a big disclaimer. Am I correct or are there? We are the New York State and Local Retirement System (NYSLRS), the retirement system for New York State employees and employees of municipalities outside of New York City. You should contact the New York City Employees’ Retirement System (NYCERS) at http://www.nycers.org. Under your NYSLRS defined-benefit plan, you’ll receive a retirement benefit for life. For most Employees Retirement System members, your benefit is determined by how much service credit you’ve earned at retirement. For example, with 20 years of service credit, your benefit would equal 1.75 percent of your final average salary (FAS) for each year of service credit (for a total of 35 percent of your FAS). With more than 20 years, you would receive 2 percent of your FAS for each year beyond 20. It’s important to note that the annual retirement benefit you will receive is guaranteed for life. For more information about how your NYSLRS defined-benefit plan works, check out your retirerment plan booklet, which is available on our Publications page. If you’d like more information about your particular situation, please email our customer service representatives using our secure email form. One of our representatives will review your account and respond to your questions. Filling out the secure form allows us to safely contact you about your personal account information. Ok so i started later at age 47 i plan on working til 67. What percentage would i receive at retirement on tier 6. Thank you. Unfortunately, the NYSLRS social media team does not have access to your account information, but we can provide some general information. 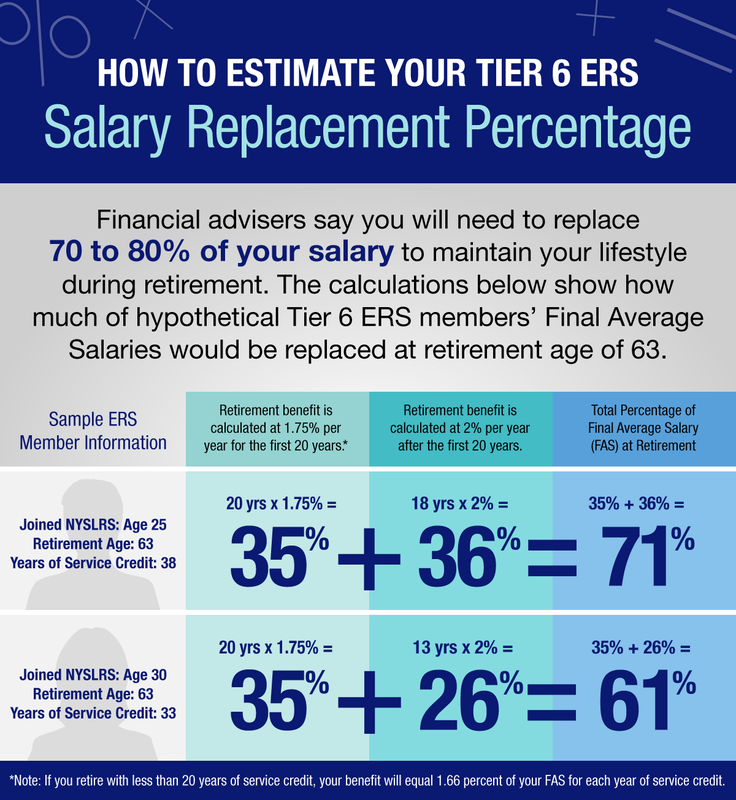 Tier 6 members in the Employees’ Retirement System (ERS) who retire with less than 20 years of service credit receive 1.66 percent of their Final Average Salary (FAS) for each year of service. With 20 years of service credit, the benefit would equal 1.75 percent of their FAS for each year (35 percent of FAS). Members who retire with more than 20 years receive an additional 2 percent of their FAS for each year of service credit beyond 20. In other words, it would be 31.54 percent for 19 years, 35 percent for 20 years and 37 percent for 21 years. You can find more information in your retirement plan booklet, which is online at https://www.osc.state.ny.us/retire/publications/index.php. To get the account-specific information, please email our customer service representatives using our secure email form (http://www.emailNYSLRS.com), and one of our representatives will review your account and respond to your questions. Filling out the secure form allows us to safely contact you about your personal account information. I was a member of NYSLRS previously (still an active tier 6 member as it has not been over 7 years since I have stopped working for the participating employer). I currently work in a job in NYC which is part of the NYCERS system. If I go back to work for an employer participating in NYSLRS can I transfer this service to NYSLRS without cost? Or is there a cost to transfer that service credit? Generally, there isn’t a cost when you transfer a membership between New York State public retirement systems. However, we recommend emailing our customer service representatives using our secure email form (see link below) and let them know what position you are considering. Filling out the secure form allows us to safely contact you about your personal account information. I’m late to the game starting at 54. I may do 10-15 years depending on the work/stress. I am wondering if it’s possible to purchase Federal service credit (non-military)? Or credit for work with another state government? Had a previous membership in NYSLRS or another New York State public retirement system. For information about your particular situation, we recommend emailing our customer service representatives using our secure email form. One of our representatives will review your questions and respond. Filling out the secure form allows us to safely contact you about your personal account information. I am in tier 6 state employee. So am I going to get pension. Everyone in my work says we tier 6 don’t have pension. Whatever we putting we get it. If we don’t put money to retirement after 10 yrs we not going to get anything. What’s reality. NYSLRS Tier 6 members do have a pension, which is a defined-benefit retirement plan. Unlike with a 401(k)-style defined-contribution plan, your NYSLRS pension is a guaranteed, lifetime retirement benefit based on your final average salary and years of service — not how much you’ve contributed. Most Tier 6 members are required to contribute a specific percentage of your reportable earnings for all your years of public service. Most Tier 6 members are covered under what’s called the Article 15 retirement plan. They qualify for a pension benefit when they reach age 55 and have ten or more years of credited service. Generally, for the full retirement benefit, you must be 63 years old at retirement. For information about your specific situation, you can email our customer service representatives using our secure email form. One of our representatives will review your account and respond to your questions. Filling out the secure form allows us to safely contact you about your personal account information.